The Bartlesville Board of Education will spotlight Bartlesville Education Promise to start their Monday meeting on Monday, Nov. 12. They will then get into Bartlesville Superintendent Chuck McCauley’s report. On the Board of Educations consent agenda, several items will be discussed for possible approval or acceptance. Some of those items include the approval of purchase orders and change orders, the approval of personnel and the acceptance of donations. The declaration of items as surplus, the approval of lease purchase items and the approval of revised policies and regulations to follow Every Student Succeeds Act will also take place during the meeting. Possible action on a new policy for access to students and directory information to follow ESSA and OSDE Federal Monitoring Requirements will take place Monday. 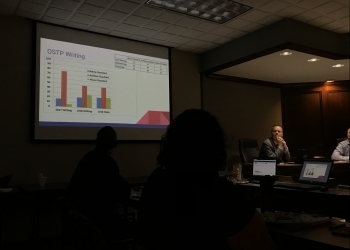 The Board of Education will possibly revise CGA policty to reflect the current federal inventory requirements as well as the current Oklahoma Cost Accounting System definitions for equipment and durable supplies. Bond issues discussion will follow.